There are some rather distinct differences between big city fireworks and small-time lake fireworks. 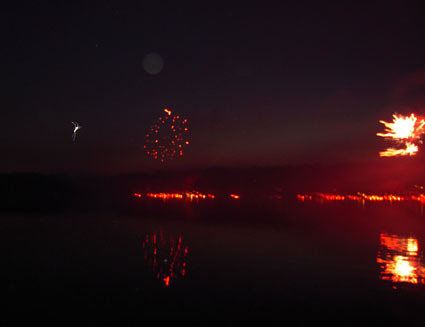 This is clearly evident in the first firing boom that reverberates across the lake, at 9 a.m. on July 4. In the city, you wait, and you wait, and you wait, until the sky is completely dark for the first boom. One thing you will never hear repeated by kids at the lake is “How much longer before it starts?” However, you might hear, “When will it stop?” Anxious trigger-happy neighbors start shooting their arsenal off at dawn, with encores happening at random intervals throughout the day. Be careful when chopping herbs on this day; you never know when you might involuntarily jump in response to a sonic boom sound. 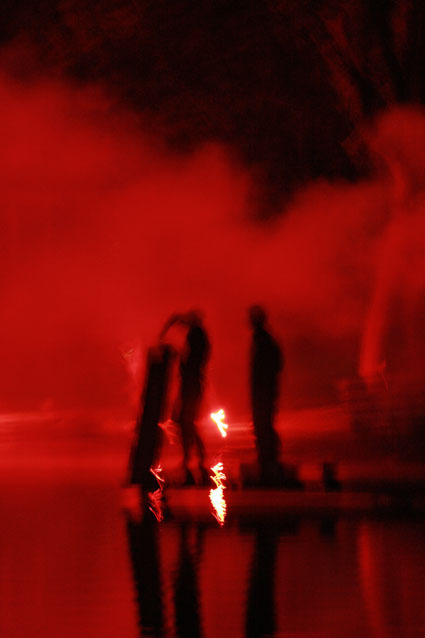 While there is no formal organization that puts on a firework show, the nightly performance at the lake is governed primarily by ego. Bigger, better, and louder than the neighbors. This allows spectators to see a full 360-degree view of fireworks, as one cottage answers another with even bigger fireworks. This can be problematic, as you never know which way to look. As soon as you see a good show to your left, the person beside you says, “Wow, did you see that waterfall?” No, actually, I didn’t. At the lake, there is a “team effort” as structures are created, all in the name of safety. One guy’s idea builds on another — until you have yourself a platform, that floats into the water for launching. Cement cinder blocks are used for stability, as the thousands of dollars of fireworks are loaded onto the platform. 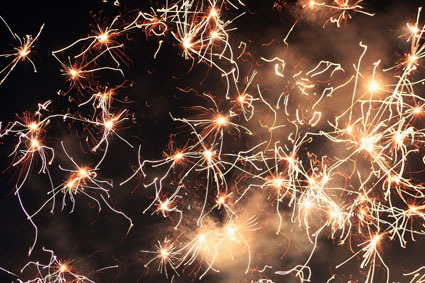 However, in an instant, one unexpectedly big boom sends the whole platform, and the entire parcel of unlit fireworks, tumbling into the water, where their flare will never be seen. Your sorrow is shared by the team. There were moments when the smoke filled the sky so thickly that you could not see; this is nice for keeping the mosquito population down. 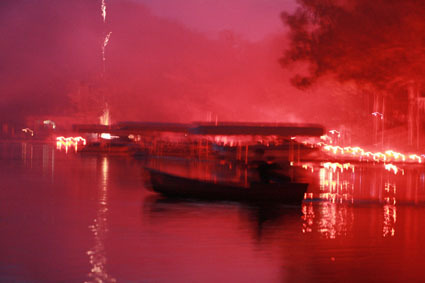 There were other times when the cornucopia of flares of firecrackers, and fireworks was so abundant, that the black shores of the lake were filled with red light. 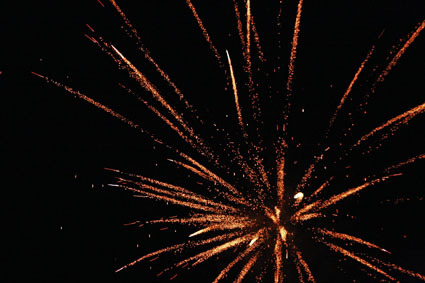 Just as in the city, the fireworks show at the lake grows with intensity as the night wears on — perhaps more so at the lake., as the show does not necessarily end with “the show.” The entertainment continually expands in response to market conditions. I was sure some motivated neighbors said to themselves, “That’s nothing… wait till you see this,” and actually ran out to the mother-of -all firework’s warehouse, (which is only five minutes from the lake) during the night, to buy even bigger fireworks, and hurried back home to set them off for the night. Lake people can be extremely motivated when it comes to fireworks. 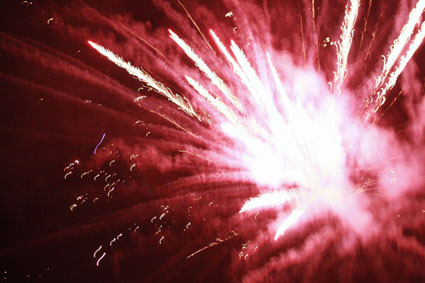 Finally, the biggest difference between big city and small-town lake fireworks can be found in the length of show. Big city fireworks are over when they are over. 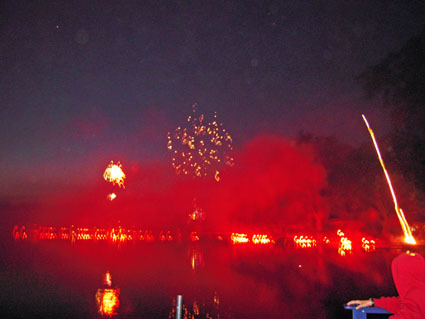 The ending of the small-time lake firework show is indefinite. 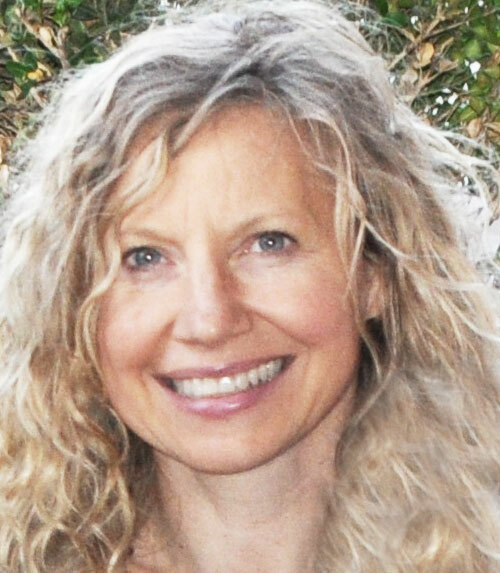 I heard my last boom at 2:10 a.m. – while peacefully resting in my own bed. The kids worn out, tired, sleeping on their bed, were unable to keep their eyes open to watch one more flash of light. So, yes, in answer to that perennial question, I do skip out on the big city fireworks so that I can watch the fireworks show on my small little lake. I cannot resist the pull of fire and water. We always choose to watch the fireworks at our own county fair rather than drive the distance and brave the crowds hanging out at the San Francisco fireworks. The only times I’ve been there was when I worked for a sponsor and I got free tickets to a private area. Like happens every other year or so, though, it was fogged in and the fireworks display stunk. I’ll take your neighbors’ attempts over high-faluting ones any time. This is so atmospheric. I LOVE that last shot. I can just imagine being there and the endless (seemingly) parade of booms and flashes! It’s a bit like Guy Fawkes in England. That goes on for DAYS!!! And I never did get why people let them off in the day time when you can’t see them!!! Aaaaaaah. The red smoke. The floating (capsizing platform). What memories.